Progress is being made in Congress. A record number of candidates have committed their support and have signed the U.S. Term Limits pledge. There are more than 200 new candidates who have signed the pledge plus previous signers, which totals to greater than 300 pledge signers. This is the most signers U.S. Term Limits has had in one cycle. 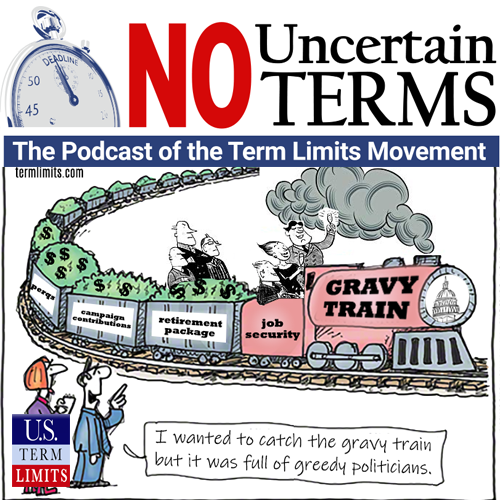 How would you know if your congress member supports congressional term limits? Check their online legislator scorecard on our website at termlimits.com/legislators, locate the legislator scorecard and press the find my legislator button. Earning an A means they signed the U.S. Term Limits congressional pledge and co-sponsored the U.S. Term Limits amendment resolution in Congress. Earning an F says your representative doesn’t care that 82% of the people wants term limits on Congress and hasn’t signed the U.S. Term Limits pledge and hasn’t co-sponsored the amendment resolution. They can also fall in between earning a B, C, or D grade. Find out what grade your legislator earned. Nick Tomboulides, was recently at a state government’s event in Westchester, a forum that helps network, develop and collaborate problem solving partnerships. It’s just a big party for politicians and taxpayers are paying for it. In exchange for pretending to care about key issues, these elite legislators get wined and dined. For example, five-star cuisines, VIP tours, and more. With perqs this sweet, can you blame them? They take advantage of the title “Representative”. Do you think it’s out of control? Send an email to ntomboulides@termlimits. When 2/3 of states pass a resolution, 34 states would be asking for this amendment called the term limits convention amendment. This amendment will continually progress throughout the upcoming elections. Check back on upcoming episodes to get an update.